Bio-Gro's introduction to the sports nutrition market sets the stage to change everything you thought you knew about protein use and protein synthesis and its role in your ability to develop muscle. Bio-Gro is a true "game-changer" from iSatori. The first to introduce a new breed of designer supplementation called Bio-Active Peptides. You can think of Bio-Gro as "fertilizer for your muscles." iSatori has custom engineered and patented the first and most technically advanced, low molecular weight, micro-concentrated form of Bio-Active Peptides (BAP's) found only in Bio-Gro. Designed to provide a supra-physiological effect that, once consumed, signals the body to amplify its natural protein synthesis process, helping you develop lean muscle and recover faster from intense workouts. 1. More concentrated. A more concentrated form of Bio-Active Peptides means less out-of-pocket expense for you, compared to regular protein powders. 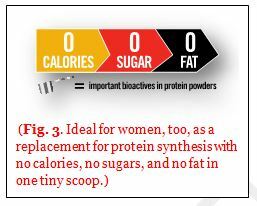 That is because one small scoop (1.5 grams) of Bio-Gro contains the equivalent bio-actives as 25 grams of whey protein concentrate. 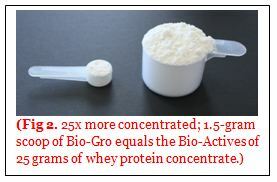 That makes Bio-Gro nearly half the cost, on a serving-per-serving basis, of regular whey protein powders. 2. More convenient. Unlike bulky tablets and flavored powders, Bio-Gro is an unflavored powder in its raw form that is virtually tasteless. Though it doesn't mix well in plain water, it does mix easily into almost everything else-from your protein shake to pre-workout to amino drink, and even in soft foods like yogurt, cereal, or oatmeal, and more. 3. More scientific research. There are over 32 published clinical studies that back up the demonstrated benefits of the primary ingredient in Bio-Gro. And more importantly, these studies were conducted mostly on well-trained athletes, participants who traditionally show less positive effects compared to untrained individuals. 4. More expert opinions. There hasn't been a supplement we can think of, to date, that has had more PhD-sports nutrition experts who independently support and validate the science and effects supporting the primary ingredient in Bio-Gro. Including such highly reputable names as Chris Lockwood, PhD; Jeffrey Stout, PhD; Jay Hoffman, PhD; and David Sandler, ABD-PhD. 5. Highest quality and banned-substance tested. Because iSatori controls the domestic source of our ingredient and has engineered the first micro-concentrated, low molecular weight Bio-Active Peptides found in Bio-Gro, you can trust and count on every batch being of the highest quality and consistency; and what's more, each batch is tested and certified free of any banned substances (via Informed Choice™ ), and is GRAS certified, HALAL, Kosher, and produced in a certified GMP (good manufacturing practice) facility right here in the USA. Bio-Gro should be used by anyone who is interested in developing or maintaining more lean body mass1-3,5,17,18, 20-24,26-29,33,36-39 and enhancing recovery from exercise or sport.4,6,9,15,35 This would include bodybuilders, fitness, figure, or physique competitors; and athletes competing in any sport, whether collegiate, professional, or recreational. Or, anyone who finds it difficult (or too costly) to consume higher amounts of protein in a day and would rather rely on a more concentrated form of the bio-actives the body will use to amplify protein synthesis. Absolutely! Many athletic women already do. Because Bio-Gro contains almost zero calories, zero fat, and zero sugars, it is perfect for dieters or women who are calorie- or carb-conscience yet want the bioactive benefits of protein to help develop and maintain lean body tissue.1-3,5,17,18, 20-24,26-29,33,36-39 And Bio-Gro requires only one tiny scoop (1.5 grams) compared to a large-sized protein shake (25 grams or more), that can leave your stomach feeling full of gas and bloated. What's more, Bio-Gro is derived from a natural source and is safe for anyone to consume. How Do I Use Bio-Gro? What Does Bio-Gro Taste Like? Bio-Gro is virtually tasteless and can be mixed in just about any drink (other than plain water) or soft food and taken with or without food. What Can I Expect From Using It? Are There Any Scientific Studies To Support Bio-Gro? Yes. To date, there are over 32 clinical studies, conducted from 1990-2011, which demonstrate the positive effects of the primary ingredient inside Bio-Gro, including improvements in lean body mass, 1-3,5,17,18, 20-24,26-29,33,36-39 performance,7,10,12,19,25,34 recovery, 4,6,9,15,35 strength,8 and immune function,13,14 and more are currently underway. No. Bio-Gro's primary ingredient is sourced locally, produced in GMP-certified facility, and every batch is tested and certified free of any banned substance. These tests are available upon request and performed by Informed Choice™ and/or HFL Sport Science. Bio-Gro complies with all collegiate and athletic organizations' nutritional requirements. What Are Some Reports For Those Who Have Used It? "Bio-Gro is now part of our strict regimen of supplementation for all of our elite athletes." "When we undertook the task of evaluating Bio-Gro, we were skeptical because our athletes are of a heightened level of success so any slight percentage increase in performance would prove to be significant and incredibly useful. Thank goodness we were right! Not only did we see an improvement in our [athlete's] performance, we also saw reduced recovery time using a natural product that is free of any banned substances. We were thrilled! We have, to date, trained 135 elite athletes on Bio-Gro, including several Olympic hopefuls and over 134 All-Americans at the high school and collegiate level. Bio-Gro is now part of our strict regimen of supplementation for all of our elite athletes." "I've gained a solid inch on my arms in one month!" "I've always been a naturally muscular guy, and must admit, I'm very skeptical of most supplements. In fact, other than amino acids and protein, I don't heavily rely on any other supplements. Then we started testing Bio-Gro, and because I am the Director of Science of Education for iSatori, I got the benefit of using it well before anyone else. By monitoring my progress closely, I discovered Bio-Gro has helped me put a solid inch of muscle on my arms, during the first month I used it. And, I can tell how it markedly helps me recover much faster after workouts. 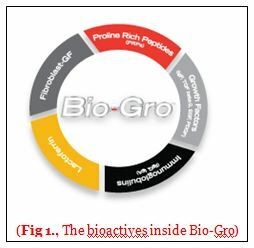 I can say, with absolutely certainty, Bio-Gro is not only in a class of its own but it will set the stage in Bio-Active Peptides and is here to stay for many, many years to come." "Everything I eat seems to turn to muscle!" "I'm what you would call your typical ‘hard-gainer.' Even though I am no stranger to the gym and lifting weights, all of my life, I have had the most difficult time gaining weight, let alone muscle mass. No matter what I ate, or how much protein I consumed, I just have never been able to pack on any respectable amount of bodyweight and keep it on. That all changed when I was introduced to Bio-Gro during their beta-test phase of development. I happen to work out at a gym in Colorado, where they were soliciting for participants in their pilot studies. I volunteered, and man, am I glad I did. Over the last three months of using Bio-Gro, two sometimes three times daily, I have gained over 15 pounds of muscle mass. That might not sound like a lot, but measured by high-spectrum calipers and a body-dunk procedure, it was verified that every single ounce of the weight I gained was solid muscle mass. Not an ounce of fat. And I ate of lot of pretty much everything. It just seemed like everything I ate turned to muscle. 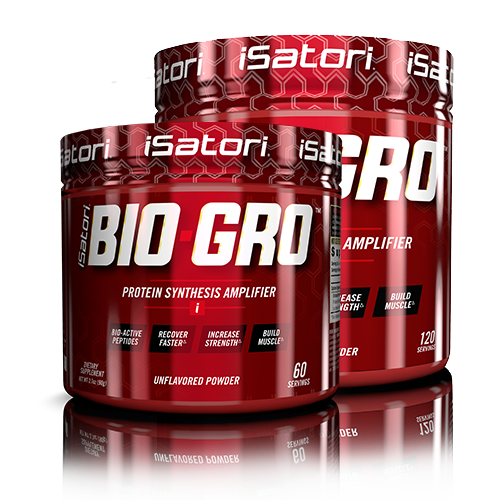 I have to say that without a reason of doubt, Bio-Gro was the answer to unlocking my natural ability to put on muscle mass as a true hard-gainer. This stuff is the real deal, and like they told me when they gave it to me, it's real ‘game-changer.'" "You might think this is just for men, but you're dead wrong!" "I've been involved in women's fitness and figure competitions for over 10 years, and now I work as a pharmaceutical representative, as well as personal train over 25 clients in the Dallas area. I understand, for me and my clients, how important it is as a competitor, or someone trying to alter their body composition, to improve lean body mass favorably compared to fat mass, and Bio-Gro did just that. When I was introduced to Bio-Gro, after one brief explanation, I immediately realized its benefits. What drew me to Bio-Gro was the convenience, because I don't always like consuming a giant protein shake, especially when I'm not hungry, and it normally leaves me with gas or bloating, which I hate; and with Bio-Gro, you only have to take one tiny scoop; what's more, I liked that Bio-Gro didn't contain any calories, sugar, or fat, which is great when you are dieting or trying to be mindful of your calories or sugar; and best of all, I was impressed by the amount of science behind it. I use Bio-Gro every day, twice a day, and recommend that all of my clients use it too." Extracted from Micro-Concentrated Colostrum Yielding:Proline Rich Peptides, Growth Factors, Immunoglobulins, Lactoferrin, Fibroblast-GF. INGREDIENTS:Medium Chain Triglycerides, Sunflower Lecithin. 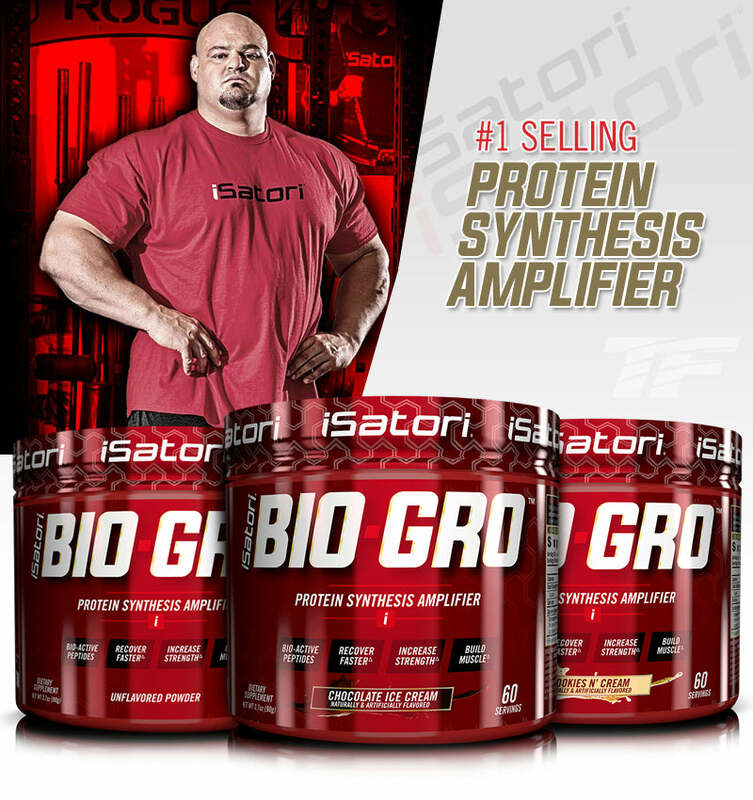 To Best Amplify Protein Synthesis, Use Bio-Gro Twice Daily As Listed. Allergen Information: Contains Milk Product (Colostrum). Warning: Keep Out Reach Of Children. Do Not Use This Product If You Are Pregnant, Nursing, Or Contemplating Pregnancy. If You, Or Your Doctor, Have Any Questions About This Product, Please Call 1-866-668-7679. Not Intended For Individuals Under The Age Of 18m Unless Instructed By A Doctor. Consult A Physician Or Healthcare Provider Before Using This Or Any Other Dietary Supplement Or Starting Any Exercise Program. Warning For California Residents Only: This Product Contains Substances Known To The State Of California To Cause Cancer And Birth Defects And Other Reproductive Harm. Exposure To Moisture And Humidity May Cause Clumping, But Will Not Affect Product Efficacy. Do Not Use If Packaging Has Been Tampered With. Store in a Cool, Dry Place. Avoid Excessive Heat. As A Dietary Supplement, Adults Mix 1 Serving of BIO-GRO Twice Daily In 3-4 Oz. Of Liquid (Such As Amino Acid, Pre-Workout Drink, or Protein Shake) and Thoroughly Agitate or Blend, or Mix In Soft Food (Yogurt, Oatmeal, Etc.). Follow Usage Chart for Optimal Results and Ensure One Serving Is Taken Before, During, Or After Your Workout. BIO-GRO Is Available As An Unflavored Or Flavored Powder That Can Be Taken Anytime With Or Without Food. To Be Used As Part Of A Resistance Training Program. To Best Amplify Protein Synthesis, Use BIO-GRO Twice Daily As Listed. Contains Milk Product (Colostrum). KEEP OUT OF REACH OF CHILDREN. Do Not Use This Product If You Are Pregnant, Nursing, Or Contemplating Pregnancy. If You, Or Your Doctor, Have Any Questions About This Product, Please Call 1-866-688-7679.Not Intended For Individuals Under The Age Of 18, Unless Instructed By A Doctor. Consult A Physician Or Healthcare Provider Before Using This Or Any Other Dietary Supplement Or Starting Any Exercise Program. Warning For California Residents Only: This Product Contains Substances Known To The State Of California To Cause Cancer And Birth Defects And Other Reproductive Harm. Exposure To Moisture And Humidity May Cause Clumping But Will Not Affect Product Efficacy. Do Not Use If Packaging Has Been Tampered With. Store In A Cool, Dry Place. Avoid Excessive Heat. custom engineered BIO-PRO Bio-Active PeptidesExtracted from micro-concentrated colostrum, Yielding: Proline Rich Peptides, Growth Factors, Immunoglobulins, Lactoferrin, Fibroblast-GF. INGREDIENTS:Sucralose, Natural and Artificial Flavors, Medium Chain Triglycerides, Sunflower Lecithin. As A Dietary Supplement, Adults Mix 1 Serving of BIO-GRO Twice Daily In 3-4 Oz. Of Liquid and Thoroughly Agitate or Blend, or Mix In Soft Food (Yogurt, Oatmeal, Etc.). Follow Usage Chart for Optimal Results and Ensure One Serving Is Taken Before, During, Or After Your Workout. BIO-GRO Is Available As An Unflavored Or Flavored Powder That Can Be Taken Anytime With Or Without Food. To Be Used As Part Of A Resistance Training Program. 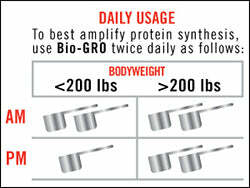 To Best Amplify Protein Synthesis, Use BIO-GRO Twice Daily As Listed. Allergen information: Contains Milk Product (Colostrum). KEEP OUT OF REACH OF CHILDREN. Do Not Use This Product If You Are Pregnant, Nursing, Or Contemplating Pregnancy. If You, Or Your Doctor, Have Any Questions About This Product, Please Call 1-866-688-7679.Not Intended For Individuals Under The Age Of 18, Unless Instructed By A Doctor. Consult A Physician Or Healthcare Provider Before Using This Or Any Other Dietary Supplement Or Starting Any Exercise Program. Warning For California Residents Only: This Product Contains Substances Known To The State Of California To Cause Cancer And Birth Defects And Other Reproductive Harm. Exposure To Moisture And Humidity May Cause Clumping But Will Not Affect Product Efficacy. Do Not Use If Packaging Has Been Tampered With. Store In A Cool, Dry Place. Avoid Excessive Heat. Custom Bioengineered BIO-PRO Bio-Active PeptidesExtracted from micro-concentrated colostrum, Yielding: Proline Rich Peptides, Growth Factors, Immunoglobulins, Lactoferrin, Fibroblast-GF.